Portal 2 writer Erik Wolpaw is sick of cake and that's why he says he "absolutely does not want to resurrect a three-year-old meme" in Portal 2. For being a short, relatively straightforward puzzle game, Portal had a pretty big impact on gamer culture. 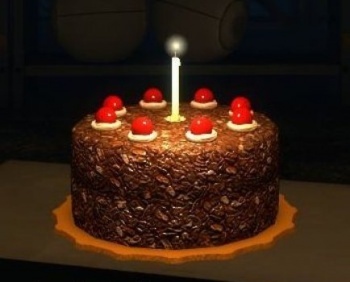 The cube, the cake, the triumph; it really is hard to overstate the satisfaction gamers took away from it. But while some critical elements of the original game, like GlaDOS and the companion cubes, will show up in the sequel, Wolpaw says he's not interested in merely rehashing an old success. "If you thought you were sick of the memes, I was sick of it way ahead of you," he told Gamasutra. "For instance, cake. I've had enough cake jokes." "The cubes are in there because they're a gameplay element, and obviously, GLaDOS is back, but there's a bunch of new gameplay and we want to tell an interesting new story," he continued. "We didn't jettison everything, but I absolutely do not want to try and resurrect a three-year-old meme. That seems like it would be kind of sad. It's not a good idea." A Valve sequel that doesn't just repeat the formula of its predecessors? It's a novel idea but it might just work. We may or may not have the opportunity to find out someday; Portal 2 is currently scheduled for release in 2011, which according to Valve Time translates into somewhere between "16 months from now" and "eventually."